I love summer, even though it is generally comes with a huge slowdown in income and a certain amount of nail-biting. The additional spare time, however, is much appreciated, as it lets me focus not only on projects in hand but on getting other "to do" list stuff done. 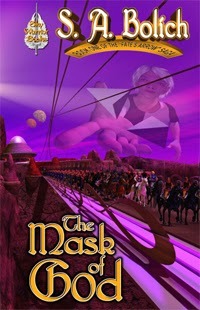 As part of that, I've updated my website with information related to the world of my "Fate's Arrow" series, which begins with "The Mask of God." I love to draw maps, both because it's a fun exercise in worldbuilding and because it lets me be consistent and clear in my head as to what is where. I can remember back in my army days when I spent a week in a jeep with a 1:50,000 map of a small portion of West Germany glued to my face, reconnoitering my platoon's deployment area in the case that we ever went to war with the Soviet Union. I closed my eyes and saw contour lines for days afterward. Fantasy maps don't have to be that detailed, thank goodness, but mine do reflect the reality of terrain and why cities tend to grow up where they do. These were both hand-drawn and will be joined by a map of Yarom at some point if I ever finish it. If, like me, you like delving deep into the worlds of the books you read, here's your chance to go behind the scenes on Ariel. Have fun!